A gorilla at the zoo. just a little fill flash needed! Great creatures, aren't they? I think your photo would rate higher if it wasn't underexposed (look at some of the higher-rating animal photos for comparison)) and therefore had more detail in the fur and face. Also doesn't look 100% sharp to me. A good capture of the moment. I think the visual would better suit the title if the zoom/crop was closer - a chest to head shot fully filling the frame. There is too much space surrounding the gorilla that it takes focus away from what you want to call attention too. 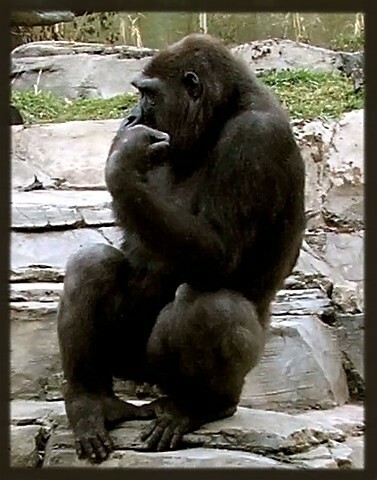 A stronger visual equation to The Thinker and this gorilla which is striking the same pose would have been to tightly crop or frame your image as a medium shot (waist to head). Not only would you call direct attention to the action and pose of the gorilla but an added boon would be that we would see more of those facial features including what looks to be an intense stare. haha... nicely done. Looks just like the famour statue. Proudly hosted by Sargasso Networks. Current Server Time: 04/22/2019 07:56:40 PM EDT.